Taipei, 10 August 2016 – PLEXTOR, one of the world’s leading brands in high-performance digital storage devices, is launching the M8Pe series, the latest high efficiency solid-state drive (SSD) built exclusively for gamers. The first PLEXTOR SSD to adopt the revolutionary NVMe PCIe Gen3 x4 interface, the PLEXTOR M8Pe series offers outstanding continuous and random read/write speeds. First-rate components, profession heat sink design, coupled with LDPC correction technology, the M8Pe is capable of providing the most stable long-term performance. By satisfying the most stringent professional gaming requirements, the M8Pe offers unparalleled performance in terms of access speeds, creating the smoothest experience for gamers. 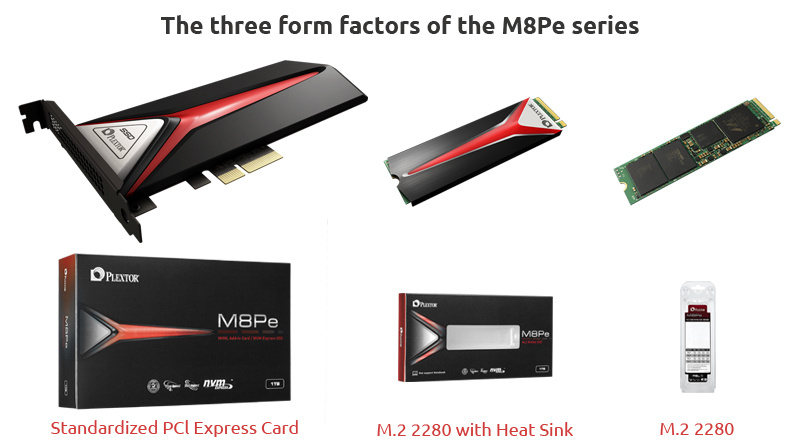 The PLEXTOR M8Pe series recreates the highest standard for professional gaming grade SSDs. With NVMe, the M8Pe significantly reduces access latency to provide faster data transmission speeds. Combined with the new generation of PCIe Gen3 x4 high speed interface, the M8Pe can provide breakthrough performances with continuous sequential read/write speeds of 2500/1400 MB/s, and random read/write speeds of 280,000/240,000 IOPS. This allows players to easily satisfy complicated data access requirements of the latest games. In order to provide the most reliable data read/write accuracy, the PLEXTOR M8Pe is incorporated with the latest LDPC correction technology that uses more advanced error correction capabilities. M8Pe’s system stability is also another important point of emphasis during product design. Equipped with the latest professional gaming grade high efficiency heat sinks, the M8PE is able to use air flow within its own chassis for rapid heat dissipation, preventing its components from overheating thereby extending the SSD’s optimum operation effectiveness and service life. PLEXTOR SSDs always use top quality components made by renowned manufacturers in the industry. The PLEXTOR M8Pe is equipped with Marvell’s latest controller chip, Toshiba’s 15 nm MLC NAND Flash memory and PLEXTOR exclusive firmware technologies to satisfy user demands for read/write speeds, performance, stability, and long-term service life. The PLEXTOR M8Pe series solid state drives will be available in mid-August. To satisfy various system configurations and expansion requirements of today’s gamers, PLEXTOR will offer two different connection standards including the PCIe and M.2 2280 in various capacities – 128 GB, 256 GB, 512 GB, and 1TB. All series of products have passed PLEXTOR’s stringent quality tests, with a 2.4 million hour MTBF (mean time between failures) guarantee in addition to a 5-year warranty period.